Henry County’s shift to blended and personalized learning started after district leaders read “Disrupting Class: How Disruptive Innovation Will Change the Way the World Learns” by Clayton Christensen, which helped them realize they needed to make a change within their schools in favor of student-centered learning. Shortly thereafter they applied for a Race to the Top grant. Although they did not receive the grant, planning for it helped them take steps to move beyond the idea and clarify what they wanted learning to look like in their schools. Henry County’s initial steps toward personalized learning were small but laid the groundwork for great changes ahead. Initially, Henry County district leaders reviewed policies and practices that did not serve their students well, identified potential barriers for principals that could be removed, and pushed schools to think about how they would improve teaching and learning. Armed with a much greater knowledge of what could be changed and what changes needed to be made, Henry County applied for and won a Next Generation Systems Initiative (NGSI) planning grant from the Bill & Melinda Gates Foundation. 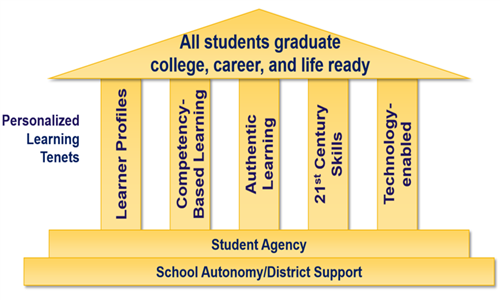 Partnering with Great Schools Partnership to define what a competency-based system would look like in their district. Partnering with SRG Technology to create Learner Profiles. Identifying and creating a school redesign process. Rethinking what professional learning would be needed to support the shift to personalized learning. This work led to the creation of Henry County’s Personalized Learning Tenets, which district leaders hoped would provide their schools with enough structure and flexibility to be able to revamp teaching and learning. They then developed a cohort approach to supporting schools, starting with six schools implementing personalized learning in 2015 and adding additional schools each year until all 50 are engaged in this work (by 2020).